Having done the rounds at Christmas with our fabulous Christmas Float, we are reminded at the moment of those moments and how cold it is outside. This prompted us to make another donation to the fantastic Center33 today as they can do with the money and other donations now more than ever. 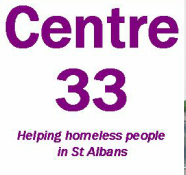 Centre 33 provides practical support for people who are homeless or otherwise socially deprived. Despite St Albans’ affluent image, people rough sleep in the area and others “doss” or “sofa surf” on the floor of friends or in squats. Others may have moved on, but still require support. Centre 33 aims to help these people by being somewhere warm and dry to meet, offering hot food and drinks, and by providing toiletries and shower facilities. If you would like to donate, you can do so on their website http://www.centre33.org/donations.html. They also accept donations of goods (warm coats, sleeping bags etc).